Welcome to our third installment of the Baked, Occasionally series – you know, the one where Natalie and I bake things from Baked Occasions and she tries harder than I do and it’s super fun? That series. So, remember when we baked that chocolate Texas sheet cake with the glorious peanut butter frosting, and at the end we told you that I had chosen the giant meat and cheese pie from the book as our next endeavor? It’s a giant. meat. and cheese. pie. One could assume that ingredients alone would run close to $1,000. Not really. But close. 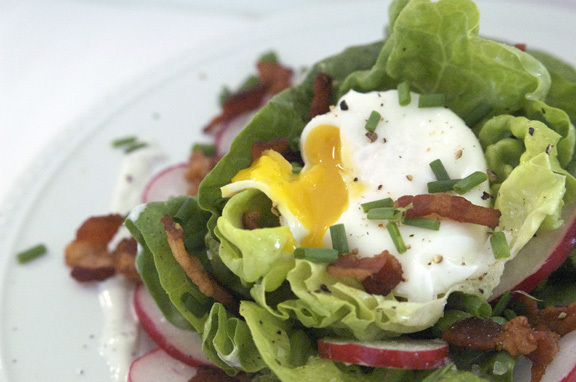 Mr. Table is typically laid-back, except when it comes to holiday main dishes. For Easter, that means ham. And only ham. Not ham in a pie, no no: just an actual ham. Which leaves me no real way to use up the meat and cheese pie. There’s zero way the two of us are taking down a giant meat and cheese pie, which would have left a major amount of food waste, and I just couldn’t justify that. Alternatively, I would have had to take down the entire meat and cheese pie, and I can’t justify those 39 pounds, either. Ain’t nobody got time for meat and cheese pie this year. 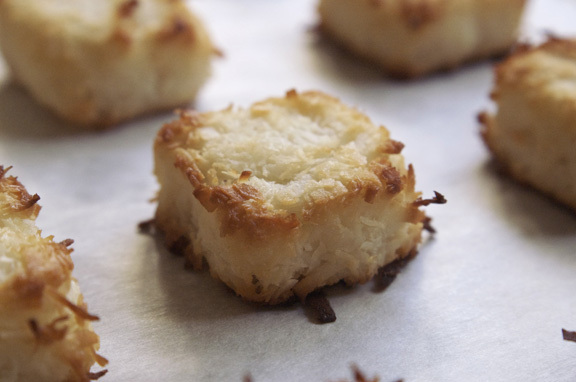 So I checked with Natalie, and she agreed: we could change my choice for this month to coconut cake, which is infinitely more practical, since Easter dessert rules are pretty wide open around here, and I usually make these incredible little coconut macaroons anyway. Easter was low-key for me this year: normally I do a massive spread, but this year was less elaborate and more focused on a few things everyone would like. This coconut cake was one of two desserts: the other was that strawberry pie you may have seen on my Instagram, if you’re into that sort of thing. As fate would have it, Natalie and I made this cake on the same day, which is the best because we end up baking together – in a way – thanks to the powers of the internet. After some discussion, we set out to work: she was going to maybe do the frosting the same way as the book does it (piping it into little dots across the entire top of the cake), I was probably going to top the cake with a ton of toasted coconut and call it a day. I also had major delusions of cutting this cake into three equal rectangles (it’s a 9 x 13 situation) and stacking it to make one rectangle layer cake a la Publix; that clearly did not – could not – happen. The Cake – is really poofy. If you use a glass Pyrex baking dish, it will fill that entire thing once it bakes, and that is a wonderful thing. It doesn’t sink in the middle, so you have a nice flat surface to frost, and it releases really well from the pan, provided you did your buttering/flouring correctly. It’s a sturdy cake: we both agree this is as close to a pound cake as you can get without it actually being a pound cake, and it had fantastic flavor: the combo of the cream of coconut, coconut extract and flaked coconut is perfection, and the little bit of vanilla extract in here smooths the whole thing out. I was worried that the massive amount of flaked coconut in here would somehow lead to the cake being “stringy” or somehow difficult to cut, but my fears were unfounded: the coconut mostly melts into the batter, which has a dense but not heavy texture and a tiny bit of (very pleasant) chew from the coconut. The Frosting – This is where I complain. Here’s what I’ve found after making maybe a dozen or so frosting or filling-based recipes from the Baked books: the baked goods themselves are epic and glorious, but the frostings and fillings can be a nightmare. I don’t mean they’re not tasty: they totally are (most of the time), but getting a decent finished product is almost painful, even for an experienced baker. They’re fussy, the chance of them being too loose or breaking is high, and I feel like overall it’s a lot of effort for a frosting. And I’m totally into effort, but I do believe that effort should result in something being measurably better than something I put less work into. And that’s just not the case here. I felt like ultimately the frosting detracted from the cake’s flavor. I feel like it could have been less work. I feel like it didn’t have to wait to break on me until the last pat of butter went in the bowl…that was sort of insulting because I knew Natalie’s had broken, and I thought maybe mine was in the clear. But broken or not, the frosting just didn’t have the beautiful, rounded flavor that the cake did: it was heavy, a little greasy (3 sticks of butter = too much butter), and missed the mark for me. To be fair, Natalie liked it, and felt like it coordinated with the cake pretty well, but deeper conversations with her about his reveal that she is slightly nicer to frosting – in general – than I am. Frosting lovers: she’s your more reliable source on this. Frosting skeptics? Listen to my words. As I mentioned, we both broke our frosting. Although we are the same most days in every way, we took two different routes to solving this problem. Natalie – really excels at un-breaking frosting; she even has a tutorial on it here, and it works, because Normal Me would take the time to fix it, as she did. Then she piped it all over her cake and it looked adorable. Shannon – Was over it this time, and threw the frosting on the cake with what? Toasted coconut. Because it covered up my error and also, it’s delicious and every coconut cake should have a good deal of toasted coconut on it. I still say it couldn’t salvage the frosting, but it made it acceptable to serve. Would I make this again? Yes to the cake, no to the frosting: there’s something nagging at me about it which generally means I know I could find a better match for the cake. I have a few ideas – one involving a rework of a certain Momofuku frosting I love dearly, and another that magically combines this cake, ice cream and chocolate ganache – which I plan to explore at a later date. Until then, I’d highly recommend this cake, but I’d stick with a frosting you’re comfortable with for the top. Maybe use a vanilla buttercream and add a little of the leftover cream of coconut and some coconut extract to it to coconutize it a bit. I’m going to give you the recipe for the frosting this one came with, because hey: maybe some of you like a challenge, and I’ll report back on future cake experiments. If the frosting breaks, head right over to Natalie’s post on how to fix broken things, and she’ll help you get your frosting back on track and looking lovely. Go look at her post on this very same coconut cake to see her results; you’d never know her frosting broke. 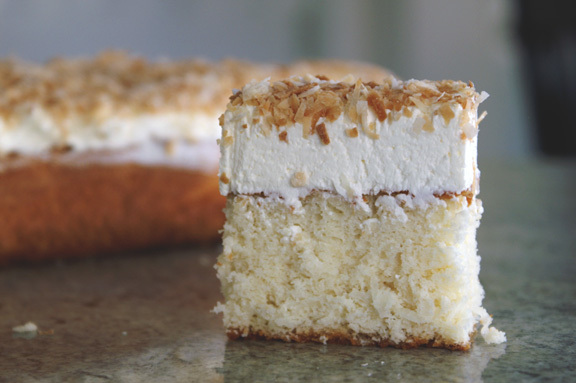 Adapted (only in the way that I did toasted coconut on top) from Baked Occasions: Desserts for Leisure Activities, Holidays, and Informal Celebrations by Matt Lewis and Renato Poliafito. Preheat oven to 350˚F (for metal pans) or 325˚F for glass (I used the latter). Butter bottom and sides of pan, then lay a piece of parchment paper in it so the long sides overhang the edges: butter and flour the pan, knocking excess out. In a large bowl, sift together flour, baking powder and salt; set aside. In a medium bowl, whisk together cream of coconut and whole milk; set that aside too. In the bowl of a stand mixer fitted with the paddle attachment, beat the butter and sugar at medium speed until light and fluffy, 3 minutes. Add coconut oil and beat until incorporated; scrape down the sides of bowl. Add egg, egg yolk, coconut extract and vanilla and beat until combined, 2 to 3 minutes. Scrape down sides of bowl again. Add the flour mixture to butter mixture in three parts alternating with the milk mixture, beginning and ending with the flour mixture. After each addition, beat for 10 to 15 seconds until combined. Remove bowl from stand and fold in shredded coconut with a spatula until evenly distributed. In yet another large bowl, add egg whites and beat with an electric mixer until foamy. Add cream of tartar and continue to beat until stiff peaks form. Gently fold 1/4 of the egg whites into the coconut batter until almost combined; add the rest of the egg whites and fold gently until combined and no streaks remain. Pour batter into prepared pan; place in oven on middle rack and bake until toothpick inserted in center of cake comes out clean or with a few crumbs attached, 40 to 45 minutes, checking for doneness at the 35 minute mark and rotating cake halfway through. Transfer to wire rack to cool completely. In the bowl of a stand mixer fitted with the paddle attachment, whisk the egg whites and sugar together until combined. Set the bowl over a pan of just-simmering water, making sure the bottom of the bowl doesn’t touch the water. Heat the mixture, stirring occasionally, until sugar has dissolved and the mixture is white, 2 to 3 minutes. The mixture should be warm. Place back onto the stand mixer and fit with the whisk attachment: beat on medium high speed until smooth and fluffy, 5 minutes. Remove the whisk attachment and place the paddle attachment back on. Add cubed butter a few chunks at a time, beating on medium-high speed until smooth and fluffy, about 5 minutes. If buttercream breaks, keep beating until it comes back together. ***NOTE: so, seriously – I thought I was in the clear with this until my very last butter chunk, which is when my frosting broke. And beating it didn’t make it come back together, although I’m assuming this does work sometimes. I’d say your best bet is to head over here to Natalie’s “unbreak my buttercream” tips which should help you solve the issue. Or just be like me and be like “whatever” and throw coconut on it. Back to it! Add cream of coconut, coconut extract and salt and beat for 10 to 15 seconds to combine. If you want to do this a la the Baked Occasions cookbook, head to Natalie’s post about this, because she did the little egg drops all over. To assemble it my way, simply lift the cooled cake out of the pan by the parchment handles, flip it over to peel off the parchment, then set it on your serving tray. Slap that frosting on using an offset spatula, whirling around the sides when you’re done to smooth the sides. Sprinkle with as much toasted coconut as you like. 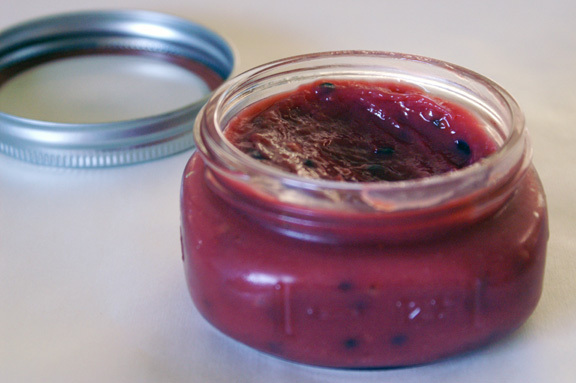 feast magazine, january 2014: passion fruit + raspberry curd. I enjoy the Baked cookbooks too. When I bake from them, I try new techniques and flavor combinations. (I never would have tried a pretzel crust without their prodding!) I have a favorite coconut cake recipe and since I’ve found it, that is what I bake. Your post has me wondering, perhaps it’s time to try a different coconut cake. 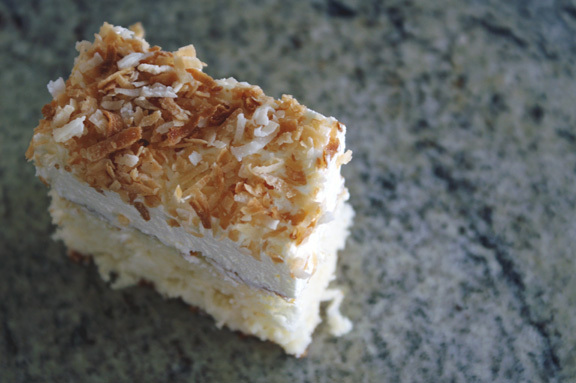 That slice, loaded with frosting and toasted coconut sure looks good! Agree! They really excel at incorporating very classic technique with some cool new flavor combinations and ideas, which is what drew me to them years ago when their first book came out. I love their approach, but i like that they mix it up a bit. the frosting does sort of hover over the cake, doesn’t it? I’m happy you enjoyed my IRL review of it, too: i like honesty because i think it just helps improve things overall. How about this: someday Natalie and i will tackle the meat and cheese pie JUST FOR YOU. Well, for ourselves too: I made a very similar meat and cheese pie (although normal size, not a giant one) for Boxing Day one year and it was fabulous, so i’m pretty stoked to try it myself. I may save it for fall or winter, because calories / comfort food / towers of meat and cheese / pick a reason. I wonder if a frozen meat and cheese pie would travel to San Pedro…? 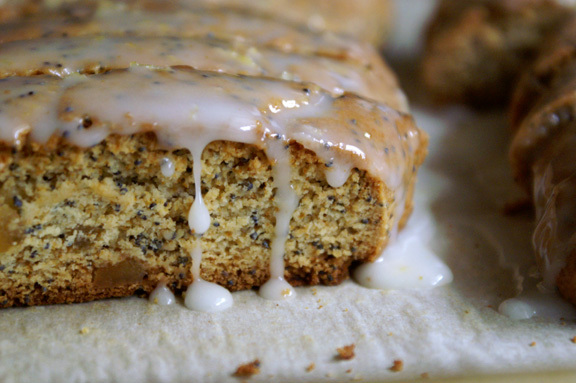 I love how you analyze published recipes and that you really come at it from all angles to suss out what works and what doesn’t, and I think it’s EXTREMELY helpful when it comes to anything related to baking. I’m not a frosting skeptic, but I need a frosting to taste AMAZING for me to want to make a cake, and so your guidance is very extremely helpful. You and i are coconut and lemon twins then: i sometimes forget how much I enjoy coconut, honestly, but when i have it? I remember. As for the frosting, ask Mrs. KR about it: sometimes people really love a swiss meringue frosting, or perfectly spun buttercream, etc…sometimes people just like a frosting that won’t give them trouble. I feel like everyone is different, but i definitely prefer the latter: i don’t like to worry about the final step of a cake. I get where they’re coming from, and i’m certain there are many who would prefer this type of frosting to one I could rustle up, but i enjoy flavor AND ease of use. 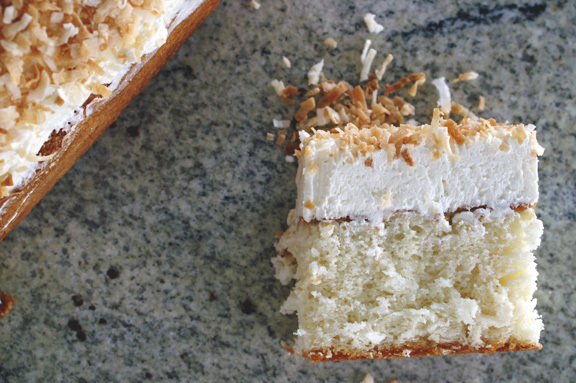 I’m a major coconut fan, so this cake sounds kind of amazing with all that coconut in it (and on it — toasted coconut for the win!). I like that you weren’t afraid to be honest about the frosting, though. I’ve read so many recipes/reviews that are nothing but gushing good things, which is fine if they’re true, but it makes me wonder sometimes. Nice to know someone’s willing to point out the negatives (or at least, their personal dislikes) and explain their reasoning. Your writing is refreshing, as always! 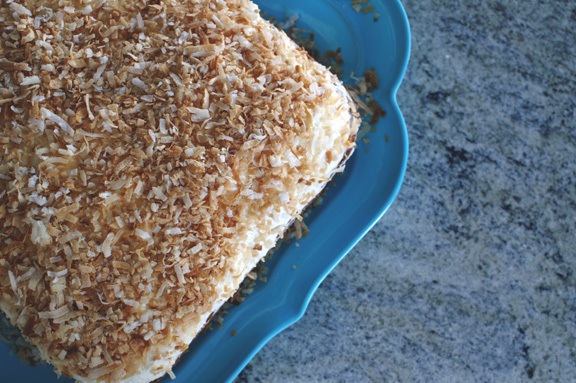 This is the cake for you, Willow: major coconut situation in the cake itself, and yes…toasted coconut is always a win in my book. I can’t imagine glossing over issues in recipes, really: honestly i wouldn’t do that to my OWN recipes, because if something needs work, it’s no one’s fault…it just needs work. I love Baked’s recipes, but I think it’s important to make things your own and really get a finished product that you know is YOUR best thing, you know? Wow, great job to you both! Definitely looks and sounds like a challenge and the best part is you both won. Having a fabulous cake turn out in the kitchen is great but it also feels really good when you’re able to overcome a problem and just make it work. I really like your addition of the toasted coconut on top; I imagine it’s a great ‘offset’ for those of us who are not huge frosting lovers. Hope all is well and hope you guys continue to have a great time baking with each other virtually! Even broken frosting is unbroken to me. I adore frosting so there is no way I would ignore this. And believe it or not I’ve never had a coconut cake or pie, because I hated coconut in my younger days. Yes, that has changed and soon I must bake this. But I’ll do a simpler frosting, because I am not a purist! And this sure beats meat pie! I feel like you can’t break the *spirit* of a frosting, right? 😉 Visually, sure, but even imperfection tastes pretty great. I’m so surprised about your coconut trouble! Although i don’t recall having it a ton when I was small (except when it was buried into 7-layer bars, where i had no idea it was there). that has to change! ry it toasted…definitely the best way to go about eating it. I’d love to have a frosting give me trouble, I’d give ‘er hell right back (with my mouth)! I know you would, Emma; i know. you. would.